Rainfall supplies water for life, but it can create a nasty brew. Twin Cities stormwater runoff carries away anything spilled onto the region's roadways and parking lots. Most of it goes untreated into Twin Cities lakes and rivers. Just a half-inch rainfall across the seven-county area creates four billion gallons of stormwater. That's enough water to fill the Metrodome nine times. There's an ever-growing web of regulations to control Twin Cities stormwater runoff. But advocates say compliance is sketchy and cleanup progress is slow. St. Paul, Minn. — Even a moderate rainfall running off Twin Cities driveways, sidewalks and streets creates gushing streams of mostly untreated stormwater. Michele Hanson, watershed coordinator for the Minnesota Department of Natural Resources, says the water carries pollutants. "There's gasoline, there's metals. If we leave our leaves and grass on the surfaces there's nutrients that go down to our resources," Hanson says. Nearly all rain that falls on forests and fields soaks into the ground. But in the Twin Cities, where about 13 percent of the land -- more than 250,000 acres -- is covered with impermeable surfaces, well over half the rainfall runs off. Cliff Aichinger, who directs the Ramsey Washington Watershed District, points to the parking lot in a St. Paul neighborhood mall. Most stormwater in older cities, he says, is untreated. "This area in Highland here has nothing, it's piped directly to the Mississippi River. A lot of St. Paul, a lot of the first-ring suburbs are that way," Aichinger says. The runoff is one reason state officials have declared the portion of Mississippi that flows through the Twin Cities impaired or polluted. Stormwater is separate from what we send down our kitchen drains and toilets. Sewer or wastewater goes off to treatment plants. Not stormwater. 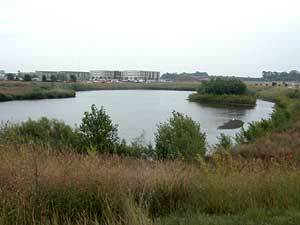 In newer suburbs, some is diverted to ponds. "About 50 percent of the nutrients and sediment do settle out," University of Minnesota storm water specialist Ron Struss says. "So we get about a half cleaning job in newer communities, but even that's not meeting our water quality goals." Most stormwater doesn't look polluted. Some looks clear enough to supply a trout stream. But a closer inspection reveals a rainbow or prism-like effect on the surface that comes from traces of petroleum products. "It doesn't take much gasoline, for example, to taste an odor problem in a body of water," says Gary Oberts, a water pollution consultant based in Oakdale. "It doesn't take much phosphorous to turn a lake green, it doesn't take much contaminants to be toxic to fish or to be toxic to frogs. They are all small numbers, and we are all the source of the problem." Some of the foulest stormwater is found in the hundreds of ponds near suburban Twin Cities' office and shopping centers. A pond near the newly rebuilt Apache Plaza in St. Anthony Village is a pit the size of an Olympic swimming pool. It's surrounded by a fence to prevent people from falling in. Water from the nearby parking lot has washed a collection of plastic bottles, wrappers and newspapers into it. The color of the water on a bright sunny day is black. Dan Huff is a watershed specialist for the Friends of the Mississippi River, a St. Paul-based advocacy group. He says ponds of this type were considered state-of-the-art for stormwater collection 20 years ago, but they're relics now. A cheaper and more effective approach, Huff says, is to dot big impervious areas like parking lots with smaller sunken rain gardens and grassy collection basins. They keep stormwater closer to where it originates, and do a better cleaning job. Many of the old ponds, Huff says, aren't maintained until the property changes hands. And then the new owners, often the city, encounter a big cleanup. "You have to drain it, get in there with heavy equipment, load all these dump trucks with polluted sediment and then take it somewhere. Hundreds of thousands of dollars of maintenance," says Huff. "Who pays for that? More often than not it's the city taxpayers who pay for that." Minnesota's progress in adopting new stormwater control ideas is slow, Huff says. States have the task of enforcing the federal Clean Water Act, a law enacted 33 years ago, which sets water pollution standards. Huff says years of state layoffs have created a climate of perpetual reorganization in Minnesota agencies. The result is cities and counties are confused about who to ask for help. State officials are writing a new document to try to untangle some of the confusion. It's a huge manual, a Bible-sized collection of pointers for stormwater management. When completed, it will be a guide for complying with rules and regulations -- and there are plenty of them. For example, anyone planning to build on, or in some other way modify an acre or more of land in Minnesota, needs a stormwater permit. The permit must include a plan for controlling runoff. At the moment, experts say, nothing surpasses agriculture in Minnesota as a cause of water pollution. But Twin Cities construction activity makes a huge contribution. With every rainfall, tons of soil and other sediment wash off urban and suburban construction sites into lakes, rivers and streams. The company putting townhomes on a 28-acre parcel in Eagan has spread blankets of straw and created sediment catch basins to slow the runoff. Dakota County Soil and Water conservationist Mike Isensee watches with an approving eye. The developer is spending extra money and taking extra time to contain erosion that could choke a nearby marshland, Isensee says. "Construction sites can load sediment at up to 10 or 20 times what an agricultural field can," says Isensee, "because the first thing we do when we start an urban construction site is we strip off the topsoil, exposing the subsoils which are silts and clays, and they are very difficult to drop out of the water column." Isensee helps landowners devise ways to control runoff. But he's also a kind of stormwater sheriff. If he spots problems, he can write up a complaint that can result in landowners being fined tens of thousands of dollars for not complying with stormwater runoff rules. Some of the rules are created by a layer of government in Minnesota called watershed districts. Most areas of the state have them, but the elected watershed board members don't have a high public profile. They do make rules that, if enforced, can have an impact. For example, Ramsey Washington Watershed's Cliff Aichinger says some Twin Cities area boards are adopting a rule that developers building on more than one acre must plan for a way to capture the first half inch of rainfall. The reason, Aichinger says, is the first half inch carries most of the pollutants. "The first half inch of rainfall has to infiltrate, can't run off, and probably 80 percent of our rainfall events are under half an inch," says Aichinger. The result is developers are searching for pervious, or porous, alternatives to long stretches of impervious concrete driveways, parking lots and sidewalks. Virtually unchecked development in the fast-growing Twin Cities area is adding acres of impervious surfaces every year. Officials say the challenge is to accommodate growth, while cleaning up the pollution already fouling the region's lakes and streams.